Going out to eat together as a family provides a chance to reconnect with one another after a long day at school or the office. Not to mention finally eating the food you have been craving all week sweetens the deal even more! Patrons should be able to sit where they choose, whether they want a booth or a table. However, one restaurant had a specific booth unavailable that evening, regardless if anyone requested to sit in it or not. The restaurant, Texas Roadhouse, is used to getting a plethora of patrons visiting them day in and day out. Their food is affordable, delicious, and very unique with how they present it. Not to mention how the whole staff sings and dances periodically to entertain their guests is an added bonus. On this particular night, the family respected the restaurant even more for why they reserved a certain booth. 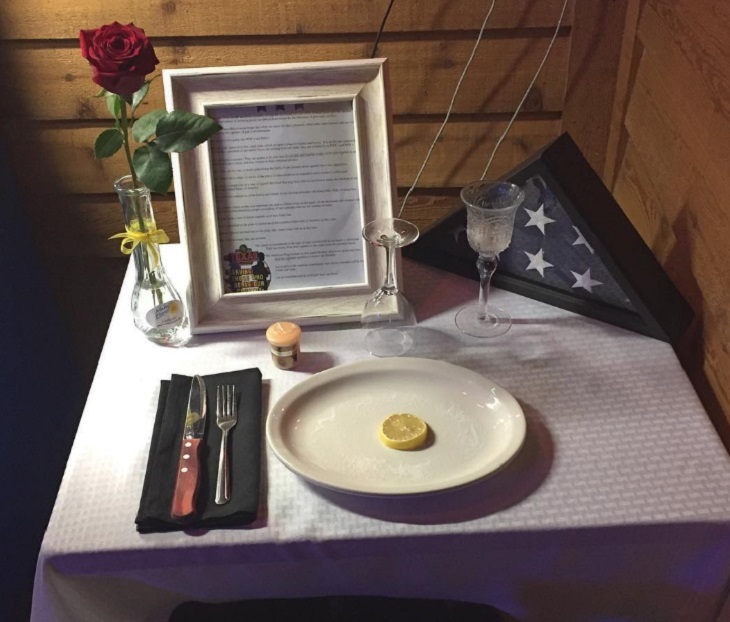 When the family took a closer look, they noticed the table had a white tablecloth, was surrounded by patriotic flags, a sign was present on the table, and it was set up in an elegant way for five people to sit there. The table was reserved for the five slain police officers during the recent Dallas, Texas sniper attack. Dallas police officers were ambushed by multiple snipers, which in the end cost the lives of five brave officers. Many patrons snapped pictures of the booth and spread the word about what the restaurant did on social media. After all, every table earns a restaurant money, so by Texas Roadhouse reserving one of their tables, they were truly honoring and showing their respect for the fallen officers. This isn’t the first time Texas Roadhouse has been in the headlines for honoring veterans and fallen officers however. They have been known to reserve tables for Veteran's Day in the past. Not only that, but they honor veterans regularly by giving out discounts on their meals as well. Not many restaurants do this, so it is very admirable that Texas Roadhouse honors their patrons that have served or continue to serve in the military. After seeing the reason why this booth was reserved, patrons admired Texas Roadhouse for what they did. More restaurants need to jump on the bandwagon along with Texas Roadhouse and honor veterans and fallen officers regularly. We remember and honor the five slain police officers, Sergeant Michael J. Smith, Officer Michael Krol, Officer Patrick Zamarripa, Senior Corporal Lorne Ahrens, and Mr. Brent Thompson, who worked for the Dallas Area Rapid Transit Police Department, that the Texas Roadhouse restaurant reserved a table for. We thank you for your service. May you rest in peace. Watch this video to learn more about what happened to the officers. We sometimes forget how much police officers and those in the military do to protect us by putting their lives on the line each and every day. The least we can all do is to say 'thank you' to them. What a beautiful way Texas Roadhouse honored the Dallas, Texas sniper victims by reserving this booth.